Caption Contest: Best caption for this photo of my colleagues at the Shrine Game practices wins a free past edition of the Rookie Scouting Portfolio. 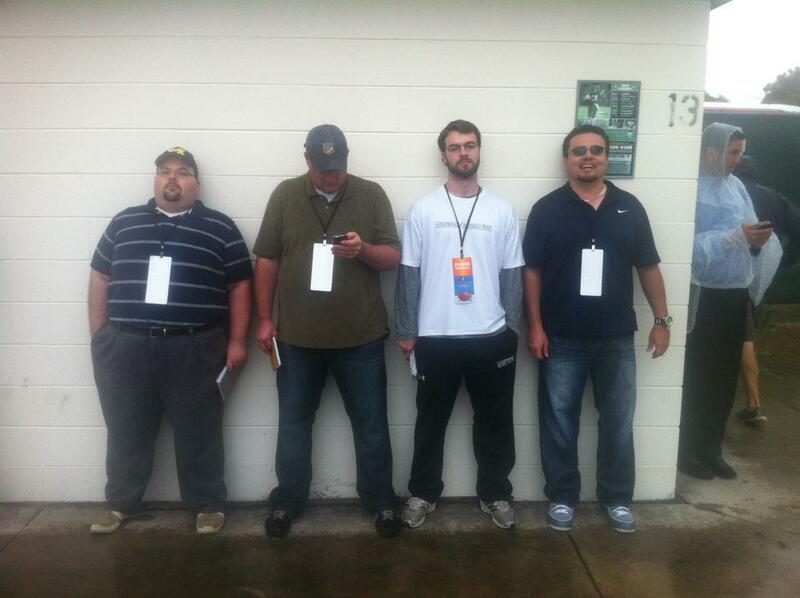 The usual suspects are: (L-R) Bleacher Report's Michael Schottey, NFL Network's Chad Reuter, National Football Post's Wes Bunting, and ESPN Radio/Footballguy Cecil Lammey. I lifted this photo from Cecil Lammey’s Facebook page. You have one week from tonight to give me a fitting caption for this photo. Make it funny, but keep it (reasonably) cool. If you want the nomination to even come before the judges panel don’t cross the line. Most likely we’ll all be having dinner together on Wednesday night. I want to have a strong collection of nominees to present to these four to judge the best caption to go with the photo. I will be the tie-breaker judge if needed. The winner gets a free Rookie Scouting Portfolio publication from 2006-2012. Second and third place winners get a free RSP from 2006-2011 or a 50 percent discount on the 2012 RSP. You must answer every question on the form to qualify. I might give out more RSPs for really funny self-deprecating facts. If you’re going to win for potentially busting on these guys, you better be able to deliver something funny about yourself.